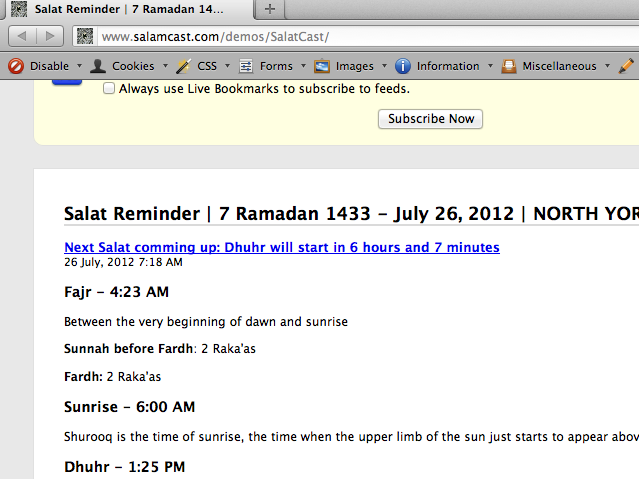 This class can generate a feed with the Salat times of a location. It tries to find the current user geographic location based on the IP address and generates an feed in Atom format with the upcoming Salat prayer times. 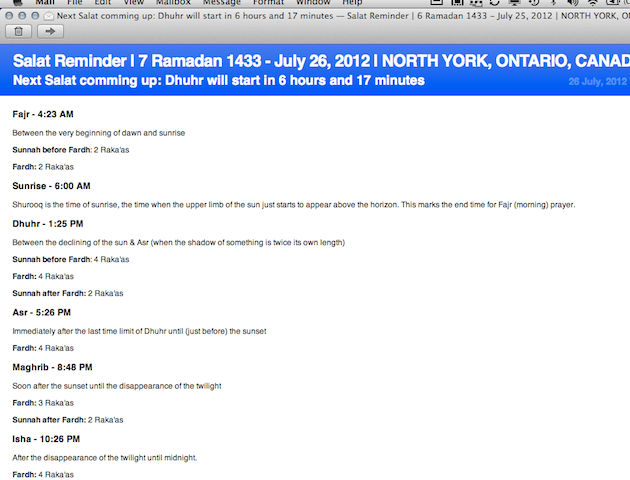 The generated feed entries have links to Islamic Finder site. The IP address location can be cached on a file to avoid overhead of determining the user geographic location again. Prize: One copy of the Zend Studio Salat is a ritual worship that Muslims have to perform at specific times. This class helps Muslims determining not only what will be the next Salat time depending on where they are in the world, but also future Salat times using a RSS feed that is regularly updated depending on the current time. This RSS feed can be pulled by applications that can be used to alert the Muslims in time for their prayers. since we are not always in the company of our brothers and sisters in Islam. configured in the config.ini file;  I've added some comments to help you configure it to your needs. Please download this and run it on your own web server, this will help keep the feed generating nicely. If you notice any mistakes in my readme or code or calculations, please feel free to let me know.